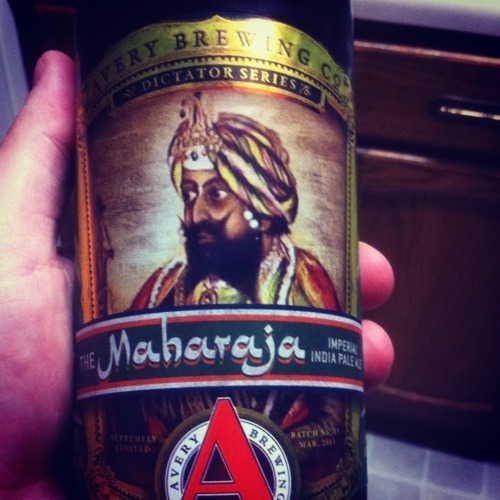 Vibrant and forceful, the Maharaja rules over an enormous amount of floral and citrus hops that are confidently bolstered by a sturdy frame of toasted malt. The finish is viscous and smooth, with a softly gloved alcohol presence that belies its strength. In the Glass: In the glass, it looks like a typical IPA. I don’t really know what makes it an imperial IPA… but who cares. I like a good hoppy beer that leaves a good aftertaste. The lace on this beer is weak too, and for a beer that has this much hype I expected more. Nose: The nose is sweet, almost tangy. I like the hint of orange you get on the tip of the nose too. It doesn’t smell like alcohol, which with a beer reaching 11% ABV you might think you would/could pick up. The sweetness is overwhelming. Flavor: The beer hits your tongue with force… and slides down smooth leaving a sweetness on your palate. It’s wet, cold, and doesn’t really have the booze that I have heard it packs. Jake said, “Oh man, drink that soon. That needs to be sipped on fresh.” Well it’s not fresh. It’s not cheap either. But the flavor is impressive. LIke I said, I don’t care for Avery… but this one is solid. Aftertaste: I expect most IPAs to have a big, hoppy aftertaste. This one does not. It’s cool, calm and collected and has a soothing barleywine flavor. Maybe that is what makes it an “imperial” IPA… one that tastes like an IPA but reminds you of a barleywine. I am glad we opened this because that bottle has been starring at me for a long time! I like it… a lot. Bottoms up people! One more IPA. Geez, is there any other beers besides IPAs in our fridge? I’m beginning to wonder. This one is a big bottle, with foil on the cap. Apparently it’s from Avery Brewing. In the glass, the beer looks very thick, with a typical IPA color and head. The smell is very strong – I got a whiff of it without even sticking my nose into the glass. It honestly looks just really thick and smells very hoppy and spicy like a typical IPA. Let’s hope the taste has something to differentiate it. Wow, this beer packs a punch. It tastes very thick as well, but has both hops and a lot of flavor to it. This beer, in a way, reminds me of the one we just had, the Titan IPA. The difference is that both the flavor and hoppy taste are like the Titan flavor and hops times ten. This is a good IPA, but one with punch. It makes sense – Ricky said it has a high ABV as well. Glad I’m splitting this beer with Ricky, as I’m not sure I could drink all of it myself. I like it, and it tastes good, but it’s almost too much. I have only taken two drinks and I’m ready to stop – I’ve had enough. This beer is good, but it’s almost a little too over-the-top, to its own detriment. Probably one I’d taste again, but not buy a bottle for myself. But, not every beer is for everyone. Somersault offers a refreshing change from blonde summer ales, with a relatively dry palate from a long, low-temperature mash, and a deliciously Belgian acidity at the finish. Sheryl was in Indiana last week… And she brought back a TON of beer. There are a lot of great breweries in Indiana, and I miss Three Floyds the most.